Eastern Asterousia mountains are barren, rocky, hard and beautiful. 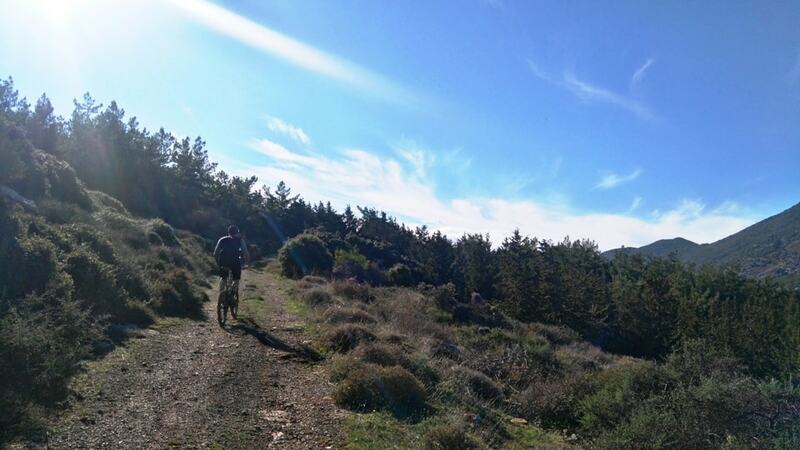 Unlike Koudoumas, where the microklima south of Kofinas creates a large pine forest, here dominate the thymes and the astivides which are transformed to small, dense and thorny balls to protect the moisture of their ground and defence the attacks of the hungry sheep and goats. Few small green oases with oleanders pop out in the ravines where there is a little more moisture. In these small oases near the shore where there was water used to stop the ships from the East. A small oasis is also the palm forest of Agios Nikitas, which is fed by Kefalovrisi, a spring of constant flowing water next to the church of Agios Antonios. According to one theory the palm forests of Crete created from the seeds of the dates which the Phoenician merchants eat during their stop for water. In the past, the inhabitants of Achendria used to go to Agios Nikitas and Agios Antonios from the path that passes from Turku Lakkos, later was constructed the road from Apomini but abandoned when the new road was built about thirty years ago. Today although the road of Apomoni is destroied is very beautiful. 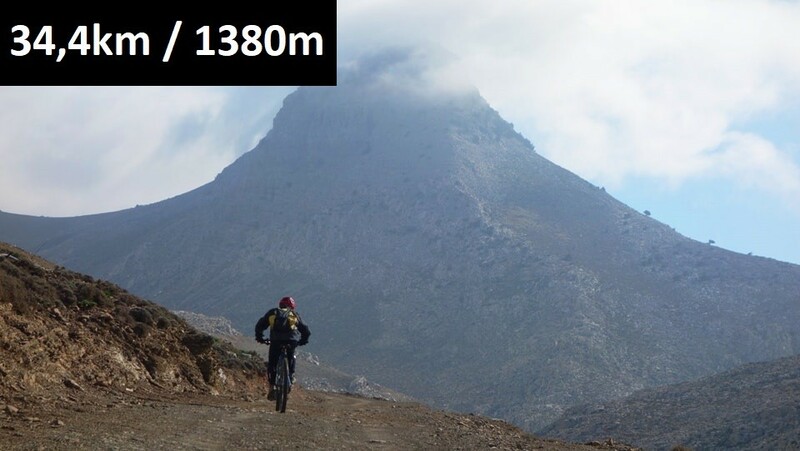 The downhill is only for the experienced cyclists. The descent to the beach is from the old road which is no longer used. In many places the road is destroyed and is steep, and slippery. The view, amazing. 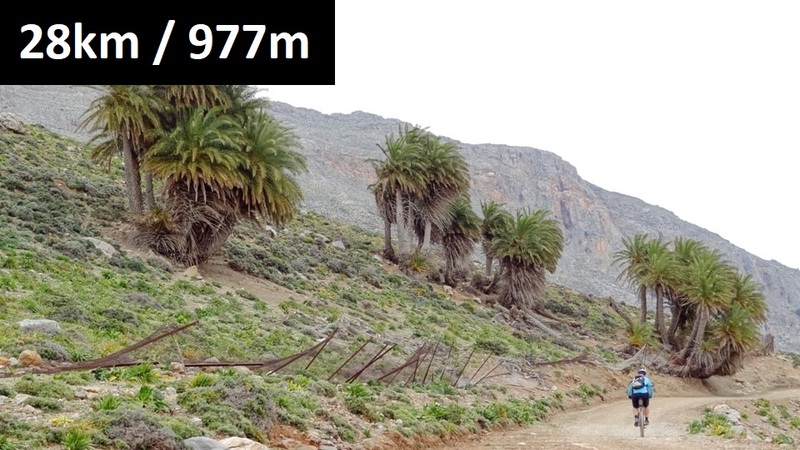 The palm forest of Agios Nikitas consists of theophrastis palm trees. 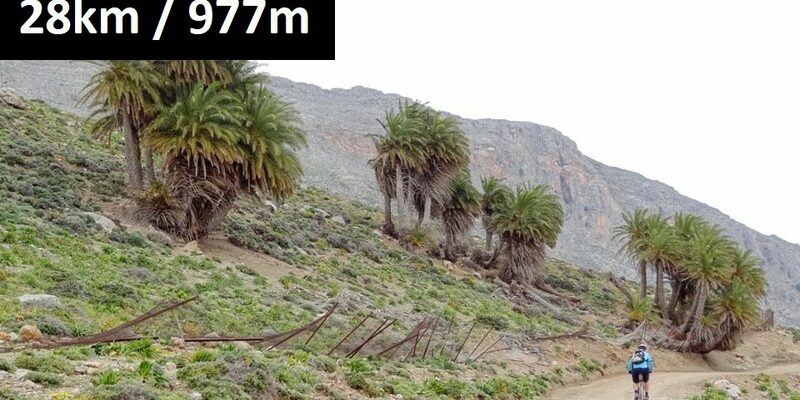 The Cretan Plam tree or Theophrastii Palm tree (Phoenix theophrastii) is a small palm, endemic of the eastern Mediterranean, with very limited expansion, mainly in Crete and specifically in Vai, Preveli and Asterousia. Saint Nikitas is considered the patron saint of the victims of the pirates. 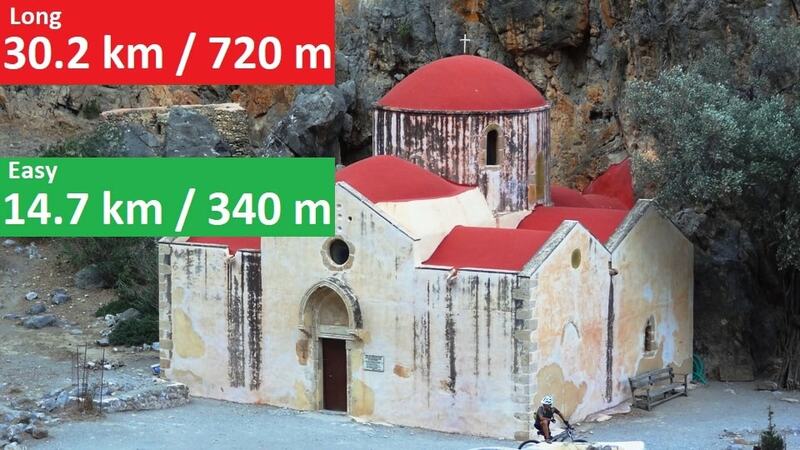 This is why the Cretans built their temples near the seashores.As in Frangokastello so here we heard the legend of the beautiful Crertan girl that the pirates kidnapped for slave. After a year or more, Saint Nikitas brought her back. The first part of the climb is steep. Some cyclists will push their bikes. The magnificent view of the Libyan Sea and southern Crete from Asterousia mountains. Download this route for FREE in any file format!